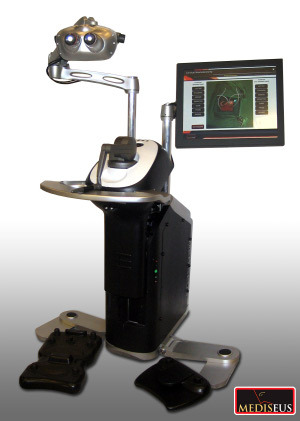 The Mediseus® Surgical Drilling Simulator uses the same viewing and operating technology as surgeons use during actual procedures: a simulated stereoscopic 3D microscope, and a sense of touch. Medical trainees hold a PHANTOM® haptic device from SensAble, which provides force feedback as they perform the surgical procedure. The haptic device pushes back on the user's hand, teaching the proper movements necessary. A telelearning capability also allows remote, haptically-enabled, surgeon-guided training. For example, a surgeon using a Mediseus® simulator in Australia can train a resident on a Mediseus® in Sweden -- guiding the trainee through the procedure haptically, so that the trainee "feels" the surgeon's correct drilling procedure. From Medic Vision Ltd Utilizes SensAble Technologies' Haptic Devices to Deliver Realistic Surgical Drilling Training ... via Force Feedback Haptic Technology Used in Surgical Drilling Simulator. Thanks to Moira for pointing this story out.